For a city known to many as the home of macro beer, it may be surprising to learn just how large the craft beer community has become in St. Louis over the last few years. The days of a Budweiser supremacy are long gone as, one by one, breweries open their doors in the “Show Me State,” creating a strong community of beer enthusiasts. While St. Louis has quickly become a craft beer destination, there is still room for growth, as each year we have seen established beer-makers the torch to the new names in the community. Here are seven breweries you have to visit in St. Louis. When Phil Wymore first opened Perennial in 2011, his mission was to be “a small batch craft brewery dedicated to the production of farmhouse ales, seasonal styles and cellaring varieties.” While that sentiment still exists today, Perennial has grown to become a household name in the ever-evolving craft beer scene. Under the guidance of Phil, Perennial has pumped out not only some of our favorite stouts like Abraxas and Sump Coffee Stout, but has also developed some of our favorite brewers, two of which have moved on to other breweries that are included in this piece (Side Project and Rockwell). Having opened a second brewhouse just a few months ago, Perennial is looking to finally have the flexibility to execute some of the creative brews that have been backlogged for some time. Perennial has begun revamping their tasting room and will continue to make changes into early 2017. Look for expanded food offerings, additional draft lines, and an updated decor. It’s been two years since Perennial’s former head brewer Cory King, and his wife Karen, first opened their tasting room, the Side Project Cellar to the public in Maplewood. What was once a dream to have their own side-project has quickly evolved into one of the top breweries in the country. 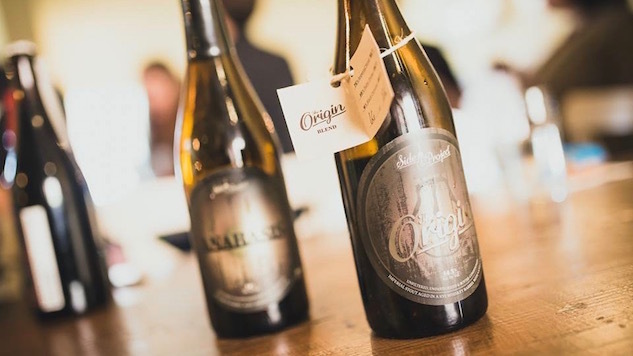 As a 100% barrel-aged brewery, Side Project has dabbled in a range of styles from fruit-forward Wild Ales to rich Stouts to, most recently, beer that are Lambic-inspired, executing each flawlessly, leaving beer enthusiasts wanting more. For those who want to try some of Side Project’s offerings, you’re going to have swing by the Side Project Cellar, where there’s always an array of styles to choose from, and if you’re lucky, some bottles you can take home with you. As for the brewery, construction is still in-progress. The completion date can’t come soon enough, as the new brewery means more beer for all of us at the Cellar. It’s been 10 years since co-owner and brewmaster Steve Crider received a home brew kit as a Christmas present. Over the next decade, Steve continued to tweak his brews until he was finally convinced to open what would become 2nd Shift Brewing in 2009 with his wife Libby. Since then, the response has been overwhelming as they have gone from 300 barrels to 1,200 this past year, with no sign of slowing down in sight. The brewery recently announced that they will be opening up a second home in St. Louis, which will be used as a production facility, barrel-house, and most importantly, tasting room for visitors. Steven and Libby, whom have fallen in love with the craft beer community in St. Louis, are looking forward to bringing some of their well-known sours like Katy beer and stouts like Liquid Spiritual Delight (LSD) to the quickly growing craft beer scene. While there won’t be an option for food onsite at the start, they are looking to outsource space in the brewery to a local restaurant. For those of you that are looking for your fix of hoppy beers in STL, Narrow Gauge is your answer. Having been only serving beer since June of this year, Narrow Gauge has already attracted a dedicated local following. Co-owner and head brewer Jeff Hardesty and his wife had been looking to open brewery in rural Missouri when they ran into the owners of Cugino’s, a local Italian restaurant in 2014. Two years later, Narrow Gauge found their home inside Cugino’s. While locals can expect to see stouts and barrel-aged wild ales in the near future, Jeff currently enjoys brewing what he loves, IPAs and Pale Ales. A self-proclaimed “hop head,” Jeff was inspired by the hoppy beers coming from breweries like Hill Farmstead, Trillium, and Tree House, and he tries to harness that inspiration in the beers he releases at Narrow Gauge. For those of you that are looking for something to take home, Narrow Gauge just installed their first crowler system. For one of the more unique brewery experiences, 4 Hands is definitely a spot you need to check out in person. Coming off of their recent renovation, 4 Hands provides the tale of two floors, with their original onsite taproom on the first floor, but on the second floor there’s an arcade room equipped with ski ball and retro arcade games. While there, you’ll be able to try one off their 10+ beers on tap that range in styles. If you need a suggestion, 4 Hands has become known for their milk stouts so start there, we’re sure you won’t be disappointed. Having trained under Phil Wymore and Cory King during their time together at Perennial, Andy Hille is looking to become the next big spin-off from Perennial in the rising STL craft beer scene. When Rockwell opens their doors in early 2017, there will be a focus on two distinct product lines, clean beer in 16 oz. cans and funky beer in 500 ml bottles. Andy notes that, “regardless of style type, the mission will always be to achieve balance in the beer we create. Flavors should complement each other, but never overwhelm.” While you can already go to their website to check out some of the beers they plan to offer, Andy knows he wants to be adventurous once they open, and work with locals to make the styles they want to see. When Rockwell opens, they will offer visitors merchandise and beer to-go (cans, bottles and crowlers), a tasting room, and full scale production facility with a 15 barrel brewhouse. While there will not be any food available in the brewery itself, Andy is looking into a few options including food truck park, that is in close proximity to the brewery. It’s been almost 25 years since Tom Schlafly and Dan Kopman first opened the doors to St. Louis’ first brewpub since Prohibition. Since then, Schlafly has grown to become the largest independently owned brewery in the St. Louis area, pumping out a number of styles and 60,000 of beer between their Tap Room located in downtown St. Louis and Schlafly Bottleworks in Maplewood. While Schlafly is one of the only breweries from St. Louis you might have seen at your local beer store, that shouldn’t stop you from swinging by either location, both of which offer a full menu for dining, and most importantly, several beers to choose from. Look for additional information in the coming months on new additions for their 2017 line-up.